I created this collage because each of these artists caught my eye. But there are many more featured in the preview Flickr pool; there will be a link to follow. 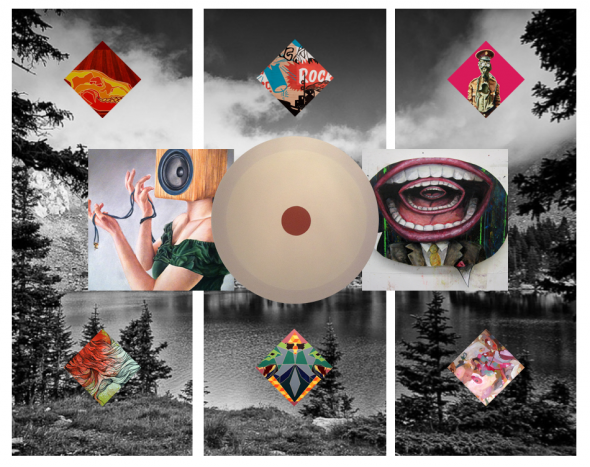 But for now the artists’ work featured in this collage include: Alex Gelmers, Blake Stewart, Michael Hatcher, Tim Hearne, Theresa Hultberg, Bryan Cook, Kalee Jones, and Blake Hargrove. All will have this and more at Momentum, which runs March 1-2. Time for the yearly dose of “Momentum”! What’s different this year? A location change for starts! I’ve also spotted that Oklahoma Visual Arts Coalition (OVAC) is hiding a few free tickets to this event around OKC. You can find them via clues on OVAC’s Facebook page. Otherwise you can expect to pay $10 in advance or $15 at the door. What else is happening and where do I buy these tickets if I’m not going to hunt for them? “The two night opening begins on Friday, March 1 with Momentum: Downtempo, a more mellow experience, with musical performances by Fifth Fret, Erik the Viking, and R.e.A.L. Momentum: Full Speed on Saturday, March 2, offers a louder, faster paced experience with music from Em and the Mother Superiors, Wurly Birds, and Kali Ra. So glad you asked. YES! Check Momentum OKC’s event page here. Want to see more of the art? Here’s a link to the Momentum Preview Flickr pool! Tagged ART ✍, Blake Hargrove, FB, Full Circle Bookstore, Kalee Jones, Momentum Art Doesn, Momentum Downtempo, Momentum Preview Flickr, OK, OKC, OKC 365, Oklahoma City, Oklahoma Visual Arts Coalition, Wurly Birds. Bookmark the permalink.